ZIMBABWE – Political tension is rising in Zimbabwe, with some parts of the country being rocked by intermittent violence, riots and strikes — amid revelations yesterday that leading opposition players are ratcheting up their plans to either impeach President Robert Mugabe or force an early general election. Harare and its dormitory town of Chitungwiza have over the course of this week alone often resembled war zones, with angry civil servants and equally agitated commuter omnibus operators involved in running battles with law enforcement agencies that have seen dozens of people injured and arrested. 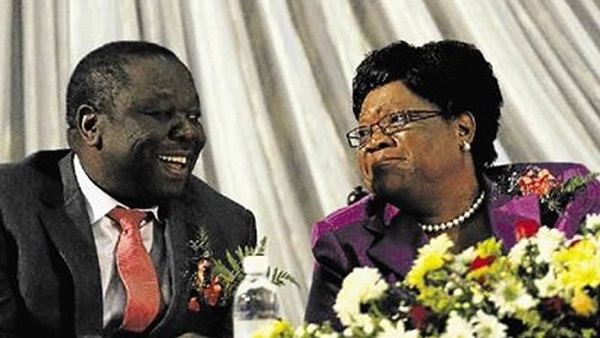 Amid all this brouhaha, well-placed sources told the Daily News yesterday that opposition leader Morgan Tsvangirai’s MDC and former Vice President Joice Mujuru’s People First movement could trigger early polls, possibly as early as this year, as the political climate in the country continues to deteriorate. Part of the plans being considered, the sources claim, involve on one hand the MDC withdrawing all its MPs from Parliament, while Mujuru’s “original” Zanu PF that uses the slogan People First — and which is actively wooing Mugabe’s post-congress Zanu PF MPs — would denude the ruling party’s National Assembly numbers through this courtship, thereby forcing an early general election. Parliament’s Standing Order Number 56 (1) and Section 137 of the Constitution provide that the Senate and the National Assembly must have a minimum number of members present at all times for them to conduct business. However, analysts say the opposition faces a daunting task to achieve a dissolution of Parliament, as Mujuru would, for example, have to lure more than 100 MPs from the ruling party’s 217 legislators for this to happen. But the Daily News has previously reported that scores of post-congress Zanu PF MPs were contemplating jumping ship to join her People First project that is set to be officially launched as an opposition party early this year. “What has been holding many of us back has been the issue of security, especially the cars that we were given by government which we are still paying for. “But we have been assured that our welfare will be taken care of and that our cars will be paid for in full, so we are now almost ready to go,” a ruling party legislator said yesterday. In the meantime, the MDC has come out guns blazing, condemning the ruling party for its violent crushing of recent peaceful demonstrations around the country. It also once again called on Mugabe, currently on his annual break overseas, to come back home to attend to the myriad challenges confronting the country, or else “resign in shame”. “The MDC would like to call upon Robert Mugabe to cut short his undeserved State-funded holiday and to immediately come back so that he can personally take control of the collapsing national economy. “The country is on virtual auto-pilot as the nonagenarian is living it up in the Far East. How insensitive and selfish can a president be? “The MDC would also like to take this opportunity to call upon all parliamentarians, across the political divide, to put their heads together when Parliament resumes sitting within the next few weeks. “It is abundantly clear that President Robert Mugabe has abdicated his responsibilities as the Head of State and as such, Parliament should proceed to impeach him,” MDC spokesperson Obert Gutu said. He said the violence that was continuing to erupt around the country was a reflection that the nonagenarian was now “out of his wits’ end and no longer fit to rule”. “He doesn’t deserve to continue exercising the duties and functions of our State President. We call upon Mugabe to call it a day and retreat to Gushungo Estates in Mazowe where he can spend time admiring his huge herd of dairy cows. “Zimbabweans have suffered for too long under the Zanu PF dictatorship that is fronted by president Mugabe. “The chains of servitude now have to be unlocked. 2016 should be the Year of The People’s Liberation,” Gutu said. He added that Zimbabwe had now allegedly degenerated into a police state, with demonstrations against the deteriorating socio-economic conditions presently obtaining in the country outlawed. “Typical of all dictatorial and fascist regimes, the Zanu PF government is determined to use brute force and violence in order to unconstitutionally stop Zimbabweans from exercising their constitutional right to stage peaceful demonstrations, “he said. With Zimbabwe continuing on its precipitous decline that is widely blamed on Mugabe and Zanu PF — and which is now manifested by a stone-broke State that can’t pay its workers, as well as rising poverty levels in the country — analysts warn of looming civil strife in 2016. The analysts have said Zimbabwe is by all indications teetering on the brink of total collapse, a situation that they claim is spawning worsening citizen despondency which could lead to growing opposition to Mugabe’s and Zanu PF’s 36 years in power.